In anticipation of the release of Pilotwings Resort, Negative World is bringing you reviews of the Pilotwings series, starting with a look back at the title that started it all. 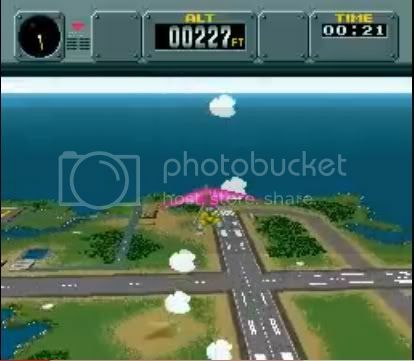 Pilotwings is best described as a flight simulator with Nintendo charm. Launching alongside the SNES in all major territories, the game impressed most critics with its great graphics, catchy music, and varied gameplay mechanics. 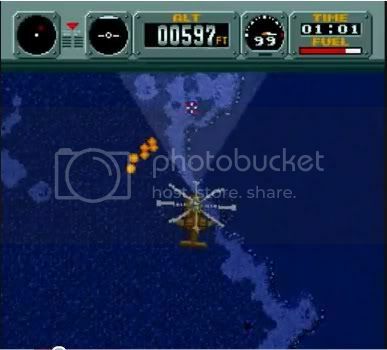 Pilotwings was originally meant as a tech demo for the SNES, but truly surpassed all expectations, providing an array of flight vehicles, each with very unique gameplay styles. You start the game as a new recruit in Flight Club, a training facility meant to whip you into shape, earning Pilot licences ranging from Bronze all the way up to the coveted Pilotwings. At first, you have a choice of two gameplay options, the light plane and skydiving. While piloting the light plane, the game has you follow a path of floating spheres leading to a runway where you have to make your landing. Initially you begin in the air, but you later have control from take-off. Skydiving begins from the moment you leave the plane, allowing you to free fall through rings for points before allowing you to open your parachute There is a risk reward element here, as opening your parachute makes your character harder to control, but waiting longer to open it makes you more likely to crash through the floor. Later in the game, you will be able to pilot the hang glider and experimental rocket belt (jetpack). Hang gliding has the added element of thermal currents, which provide lift in place of an engine, allowing you the ability to reach a specified altitude, which is a requirement before making a landing. The rocket belt offers high or low speeds of movement and a top down camera view, which is needed to help achieve a more accurate landing. The difficulty curve here is very good, offering little in the way of hindrance early on, but ramping up to markers that bounce, rings that spin, and obstacles such as ice patches on the runway. All of this serves to make you feel that you are improving and that lessons are truly being learnt with each passing stage. All modes are scored on a point system which is separated into categories such as speed, accuracy, rings passed, etc. The maximum score you can receive by perfecting each category is 100 points overall. However, you can also gain more by accessing secret bonus stages unlocked by landing on special moving platforms in certain stages. Landing on these platforms is especially tricky, requiring perfect timing and/or a lot of luck. These bonus stages are where a great deal of that Nintendo charm comes in. 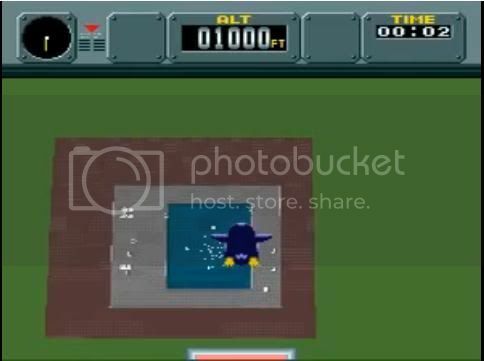 Whether it’s the penguins on diving boards, the flying birdman, or the bouncing wingman, each of these levels is a blast to play and shows some of that wacky, fun spirit that was taken even further in the games sequel on N64. A penguin jumping of a diving board, what sort of flight club is this? The Flight Club instructors also deserve a mention here, from their oftentimes funny comments to their hilarious expressions that bookend each level, these guys are chock full of personality and, for me, became instantly memorable. In a bit of an unexpected twist, it turns out that not only have you become quite the accomplished pilot, but you are also ready for helicopter stealth missions against the never before mentioned Evil syndicate who have kidnapped the instructors. There are two of these levels in all and, while difficult, they offer another fun and silly addition to the game. These levels can become frustrating at times while you try and shoot anti-aircraft turrets to create a path to your destination, ultimately landing on an unmanned enemy heliport to provide safe passage for the hostages. I always go by the mantra 'gameplay over graphics', but a great deal of the gameplay Pilotwings has to offer is thanks to its graphical style. I won’t go into it in depth here, but the Mode 7 graphics utilized in this game allowed the ability to scale and rotate 2D sprites, helping provide a 3D effect which was essential in providing a true flight simulation experience. The only downside really is that everything remains flat - even trees and buildings, which, despite looking great from a distance, appear as flat textures when you get up close. The game does feature some great effects though. The progression through day, evening, and night time levels is fantastic and crashing through the ground when skydiving and crashing in the plane look great. It is a testament to the team, especially given that this was a launch title. I don’t have a great deal to say about the audio other than it is superb. What do you expect with Koji Kondo in charge right? Each vehicle has its own theme music, which, in my opinion, perfectly complements its style of flight. I would say that Pilotwings was and still is a must play title for any game fan. The very accessible but deceptively deep gameplay offers enough challenge to keep hardened game players interested, while not scaring off the more casual gamer. The pleasing visuals and music really help to create a wonderful flight game that comes highly recommended. Pilotwings is currently available on the Wii Virtual Console for 800 points, check back next week for our review of Pilotwings 64. How well do you think save systems are implemented in modern games? I've never played a Pilot Wings game, which might explain why I have no interest in the 3DS title. Maybe I should right this wrong. I was avoiding that reference but had a feeling people wouldn't be able to help themselves. The original Pilotwings is a true classic and I urge those who haven't tried it to give it a go. I like the idea of the Pilotwings ramp-up. Do you think this game is still worth playing, considering the tech and the existence of Pilotwings 64, though? Its more than worth the play through, the gameplay in both while sharing different traits feel very distinct. I wouldn't say one is better over the other but they offer different experiences. Wow, you totally sold me on it. I really liked the 64 version the few times I rented it, but never played the original back in the day and, for some reason, it always seemed so dry to me. The screenshots didn't make it appealing, I guess. They never hinted at the goofiness that you talked about. I am glad you feel that way. The game is in this state now where people only tend to remember Pilotwings 64 and it is a shame, more fuss needs to be made of the original. I can't even tell you yet whether 64 will score more than this one, thats how close it is. I remember buying this early SNES game really, really late in the life of the SNES. I had played most everything else I wanted to and wanted a new game and it was only $10 used so I was like whatever, I guess I can try it out. Ended up loving it! Seems I gave it the same score that you did. I specifically liked how landing a plane had to be planned out. You couldn't just haphazardly throw yourself at the landing strip, you actually had to line things up and descend at a good rate and everything. It was pretty darn tough doing some of those ring missions in the jetpack though. Couldn't tell where they were sometimes. I didn't actually own this but my father bought it for himself to play on my SNES. I remember him telling me about this flight simulator game that he wanted making it sound all serious and educational, little did I know it would become one of my most fondly remembered titles in the SNES catalogue. It's the only game I have bought for my 6 year old nephew on the Virtual Console and he loves it. One day he told us he wanted to be a pilot, when we told him he had to go to school and work hard he told us "no I just have to get my Pilotwings licence". I did the exact same thing. I picked up Pilotwings late in the SNES cycle not expecting much. To my surprise, I was amazed at the depth and variety found in the game. Great graphics too. I always wondered why it took so long to see a new release. Like F-Zero, Nintendo has been sitting on a gold mine with these IPs. 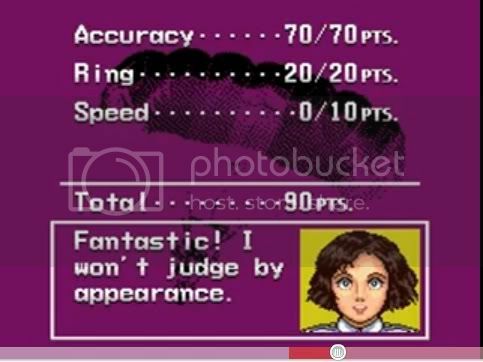 I've never played a Pilotwings game either. I don't think I really knew about the SNES version, and when the N64 came out, I didn't have a launch one so I missed out on a bunch of games. By the time I got mine, I was onto the newer games, and once that game out super early never saw my house. I like the review though, and the captions are good, haha. I bought my N64 off of someone from school. $150. I feel like there was another game, too..but I can't remember. I think my first purchase of a new N64 game was Star Fox 64. Yessss. Starfox was my first game too :D New N64 twin controller pack with Lylat Wars in '99. Best purchase I ever made. Hey this would be a cool game to try out for the VC actually. It was one of those games which I never got into yet heard so much praise for. I don't think I played it enough on the SNES to really enjoy it... or maybe didn't understand the concept of it back then. I am sort of looking forward to the 3DS release but the impressions are almost kind of underwhelming at this point. Oh, and actually, eff you for that "Watch how I soar" caption! @New Forms I heard an interesting theory, which is that Nintendo uses the Pilotwings franchise to showcase new 3D technology. SNES version was their showcase of mode 7 pseudo 3D graphics. N64 version debuted on their first 3D console. And now 3DS is the first new step forward in 3D technology for Nintendo in awhile, so Pilotwings is finally making a return. Coincidence? Seems like a pretty dead on theory to me. But it also makes me sad, because it means we may not have a console Pilotwings for awhile... unless Nintendo brings 3D to consoles. God, it's tough talking about 3D because there was you know... 3D back in the N64 days, and now 3D. Same term, whole new meaning. Let me know what you think of it here if you try it out. It truly is a great game. Good review warerare. I never bothered checking out the SNES Pilotwings for some reason, maybe it's because my first Pilotwings experience was the 64 version, which I loved. Maybe I was thinking "why bother going back to the original" since the 64 version seemed to be the definitive way to play. But you, sir, have stirred the interest within me to play this game. It's an important title in the SNES launch library that I should have been playing alongside my copy of Super Mario World and F-Zero.